History: G. Hupé purchased a total of 32 dark stones in July 2006 in Laâyoune, Morocco. Petrography: (A. Irving and S. Kuehner, UWS) Breccia composed of polycrystalline clasts (≤ 2 cm) set in a matrix derived from several different diogenite precursors. No basaltic eucrite clasts were observed. 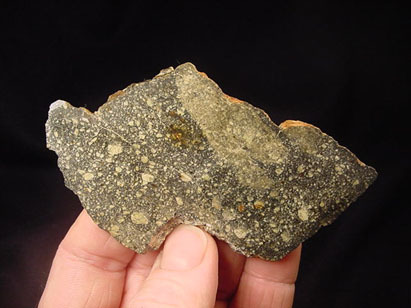 The sample is modally dominated by orthopyroxene with subordinate olivine, augite, chromite, silica polymorph, rare calcic plagioclase, troilite, pyrrhotite and kamacite. Specimens: A total of 20.1 g of sample and one polished mount are on deposit at UWS. GHupé holds the main mass.